The reality is that meeting our energy needs will require fossil fuels and renewables not merely to co-exist, but to co-develop. President Obama’s recent talk of an “all-of-the-above” approach to energy is no doubt partially motivated by election year politics. That said, there is an important kernel of truth underlying it: no one approach can solve our nation’s future energy needs. While some renewable energy advocates want the industry to be the White Knight, the reality is that meeting our energy needs will require fossil fuels and renewables not merely to co-exist, but to co-develop. This co-existence is particularly critical for two sectors of the industry: solar and natural gas. Why these two? Solar photovoltaic (PV) technology has fundamentally shifted energy production and consumption in the past ten years. For example, Germany recently set a record by producing 50 percent of the nation’s midday electricity needs from solar. Solar is also cheaper than ever before thanks to massive cost reductions. Solar has earned a place at the mainstream energy table. It is also clear that the development of hydraulic fracturing (“fracking”) technology shares the spotlight with solar PV as the greatest revolution in energy in the last 50 years. In just a few short years, our domestic outlook has changed from one of resource shortage to one of abundance. Many unanswered questions remain around fracking’s impact on health and the environment, but the fact remains that just like solar, it has radically increased our energy options. Many current debates seem to pose the question as to which technology will win. The reality is that it’s a false dilemma -- both must (and can) win if we are to be successful in our transition to a responsible clean energy future in which cheap solar, wind, and natural gas displace coal as our primary fossil fuel for electricity production. Neither of the extreme scenarios makes sense. It won’t be a natural gas 'too cheap to meter' scenario that some appear ready to embrace, nor will it be the 'renewable-only future' that others are advocating. The truth is far more nuanced. Those who understand the industry are far better positioned to see past the short-term chaos of solar and the euphoria of natural gas to the long-term balance that will shape the energy industry’s future. And both technologies fit into a compelling vision of a future grid in which renewables generate a large portion of our energy supply, while natural gas provides grid and price stability. The current politically charged discussion that pits natural gas against solar and vice versa benefits no one, and obscures a tremendous opportunity for collaboration. As someone with 13 years in the energy business (both natural gas and solar), I think it is time for these two sectors of the energy industry to set aside differences, and work to achieve what’s best for our economy, our people and our environment. Stop beating on each other. Personally, I remain an environmentalist and hope to see fracking carefully regulated as with all industrial impacts. Professionally, it is time for the renewable energy industry, including solar, to stop seeing their success in fracking’s demise. We have to begin to articulate a common vision for energy policy with a big enough tent to sell it politically. It is time that solar trade associations and lobbyists joined more closely with those of other players in the power industry. Push regulators, ratepayers, politicians and others to be 'long-term greedy.' It is tempting to make investment decisions based on today’s short-sighted views on gas prices and solar power. As I set out below, those short-sighted views have some serious flaws, and due to the capital intensiveness of the power industry, it is hard to adjust policy quickly without disrupting markets. We must keep decision makers away from the temptation of a less balanced energy plan based on short-run cost advantages. Create a comprehensive U.S. National Energy Policy. This list would be incomplete without the mythical holy grail of next steps: a unifying, environmentally responsible and economically plausible national energy policy. If we can make progress on the first two items, maybe we will have the beginnings of a consensus that not only has a reasonable plan for a national energy policy, but a political base broad enough to make it happen. Most importantly, solar can fill in for natural gas' greatest weakness: price volatility. Solar’s cost is known upfront, whereas a gas-fired generator is stuck with long-run natural gas prices as they go up and down throughout the 20- to 40-year life of the power plant. With solar, you know what the price is for 20-plus years into the future. The installed price of solar has plummeted and continues to fall. Assuming a long-run natural gas price in the $5 to $7/Million Metric British Thermal Units (MMBTU) range, solar can be competitive with gas-fired wholesale electricity in the next two to five years. Solar generation tends to peak when electricity demand peaks, given the correlation between hot sunny days and air conditioning use. In this way, solar is a good hedge to short-term spikes in the need for power that might otherwise cause volatility in the natural gas market if that power were supplied by gas-fired generators. 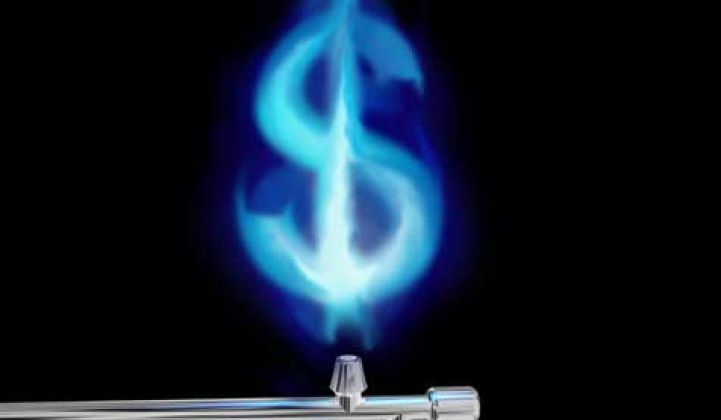 It’s true that the forecasted $2.00 drop in long-run natural gas prices could eat up almost all of the benefit of declining solar costs. But familiar flaws in our industry’s ability to estimate long-run gas prices and the uniquely complementary relationship of solar and gas are likely to yield a more balanced ending to this story. Natural gas prices have always fluctuated wildly (in a range of $2.50 to $14 per MMBTU). Expectations that long-run prices will do anything different in the future are difficult to believe. But you don’t have to take my word for it. Long-term gas contracts (more than 3 years) are priced around $5/MMBTU, so even industry participants anticipate the likelihood of doubling today’s spot prices. We know that gas supply is plentiful right now and that there's a lot more down there than we thought. But we don't really know how much of it there is at each price point of extraction or what this new resource looks like in terms of long-term production. Short-run demand for natural gas can be volatile, while supply can be hard to adjust. A hot summer day with some pipeline constraints or greater-than-expected seasonal demand and we could be looking at a nice, frothy gas market again. Demand for natural gas tracks the economic cycle. We are still in a period of low capacity in U.S. manufacturing, power generation and almost all other uses of North American natural gas. The hype around cheap, plentiful gas and the push to kill coal are likely to result in significant substitution, changes in the fundamentals of natural gas demand and a much stronger recovery in demand than is currently priced into today's forward curve. This could result in much higher long-run prices than most are predicting. None of this is to question the fundamental shift in our energy options that fracking has introduced, but a radical increase in the total long-run supply of gas may not alter the problematic elements of short-run gas supply and gas demand. Moreover, structural changes in response to this increase in the long-run supply of gas may fundamentally change demand for gas, leaving the long-run impact of “fracking” on gas prices very uncertain. So the likely outcome of the above analysis is a world with long-run gas prices of $5 to $7/MMBTU and the equivalent price for solar. I can find nothing to complain about in that scenario -- with solar, wind, and natural gas at all-time-low rates, it means we can deliver a stable, robust, and cleaner generating fleet with almost no long-term cost impact over the current regime. It’s time to embrace that future and work together to make it a reality. Sheldon Kimber is the Chief Operating Officer at Recurrent Energy and leads all North American project development, expansion, and origination activities for the firm. In this role, Sheldon drove the expansion of the company’s development strategy from a small-scale rooftop developer with a less than 100-megawatt pipeline to a leading utility-scale PV developer with hundreds of megawatts of contracted projects and a pipeline of more than two gigawatts. Formerly Recurrent Energy’s vice president of finance, Sheldon was instrumental in developing and negotiating the company’s first projects, fundraising efforts, and joint venture agreements.